Those who remember their Spanish Conquistador history (I don’t) know that El Dorado is a mythical city of gold. Despite it’s fictional appearance in the 1998 movie The Mask of Zorro and in the latest (and embarrassingly bad) Indiana Jones flick, centuries of searching could not locate El Dorado. Yet apparently these seekers were looking in the wrong place, because I struck gold with this rum from Guyana, the small South American country wedged between Venezuela, Brazil, Suriname, and the Caribbean Sea. It’s a 15-year-old blend, which makes it the second youngest of El Dorado siblings. (Patrick A sampled the 12 Year here, and there are also 21 and 25 Year versions.) The 15 Year expression can be found for around $35. Like blended scotch whiskey, El Dorado’s age actually refers to the youngest rum in the blend, which includes rum that is actually quite a bit older than that, having rested in used bourbon barrels for up to 25 years. The rums that make up the El Dorado blends come from a variety of different style stills, some that have been making rum for hundreds of years. Not exactly golden, 15-plus years has imparted a deep mahogany color on El Dorado. The nose has vanilla, coffee, smoke, and sharp citrus. My first sip overwhelmingly reminds me of pure black strap molasses, that crude oil-like stuff that would sit for years unused in the back of my mother’s kitchen cabinet. But that’s just the first layer to this rum. Below lurks a complex combination of toasted almonds, calvados brandy, oak, and vanilla. It’s a lot of power up front, that quickly fades into a complex, balanced spirit. The finish is woody with some lingering grapefruit flavors that remind me of the rum’s tropical origins. This is an excellent rum, with all the characteristics—sweetness, balance, and a hint of tropical citrus—that make fine aged rum my spirit of choice in the summer (as opposed to the winter, when bourbon and scotch is preferred). El Dorado 15 Year Old is a worthy addition to any rum lover’s liquor cabinet. It goes very well with a medium-bodied Cameroon-wrapped cigar, like the Fuente Hemingway or re-blended La Aurora Cameroon. A co-worker from Guyana recommended El Dorado to me. Up until then, I really didn't think rum had much depth of flavor. This baby proved me wrong and is a mainstay in my summer drinking rotation. Actually with rums the exact opposite is true as far as age statements. The year on rum refers to the oldest rum in the bottle. With whiskey it refers to the youngest. Most 15, 18, 23 year old rums have very, very little in it that old. You're right that for most rum it is the case that "age" means the oldest rum in the blend (for example Ron Zacapa 23 contains rums up to 23 years old). 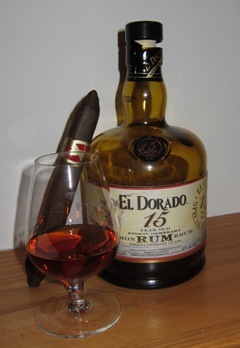 However, for El Dorado the 15 refers to the youngest rum. This is confirmed by information on the El Dorado site and also other independent rum sites. It's part of what makes El Dorado unique. Haiti's Barbancourt 15 year old Estate Reserve rhum is a fine example of what an old rum can be. Folks who think rum is just for mixing may not have had the finest ones out there. Similar to the reputation tequila had until the revival of the boutique aged tequilas a decade ago. Looking forward to trying this one! Thanks for the review.